This year Cork's very special Choral Festival has celebrated its record as the longest-lasting annual festival in Ireland, a unique story and cultural achievement in world terms. Before continuing, do first click onto our account in Seen&Heard of the 2002 Festival. Under the leadership of John Fitzpatrick the CORK INTERNATIONAL CHORAL FESTIVAL has gained in prestige and international importance. The 2004 festival opened with a special event celebrating the inspirational contribution of composer Aloys Fleischmann (Chairman 1954-66; Director 1967-8) who devoted his life to music in Cork and Ireland. A concert of his large scale music was given by the combined forces of the Cork School of Music Symphony Orchestra and Fleischmann Choir, with Paul McNamara (tenor) in nationalistic compositions which lifted the roof off City Hall, especially when and Kieran Murphy (warpipes) joined them to celebrate the 1706 rout of the English by Lord Clare's Dragoons. To coincide with this year's particular celebration an impressive written history of the festival has been published. As a record of civic cooperation and generosity, during the latter half of the 20th Century and into the new Millennium, there could be none better than this massive tome (584 pages of small and smaller print!) with contributions from a multitude of people who knew and studied with the 'Prof' ; the whole edited meticulously by his eldest daughter Ruth Fleischmann, with invaluable assistance from her younger sisters Anne and Maeve - the outcome a comprehensive source book of information and precious reminiscence. Aloys Fleischmann's name is justly revered for his 60 years prominence in Ireland 's musical life, a visionary who built up the University of Cork Music Department and during his directorship of the Festival never spared himself and, most notably perhaps for readers of Musical Pointers, introduced a Composers' Seminar with commissions for new choral works. These were analysed, rehearsed and discussed in public over the years, to general enlightenment, before their formal premieres in main festival concerts (see my account of the French composer Patric Burgan's Cry in 2002). Prof. Fleischmann's seminars were not all plain-sailing at first; Boris Blacher didn't like having his work analysed 'with a question mark over any of it' and William Walton found initial comments on his piece "not entirely to the composer's taste". To encourage discussion, his Canti del Sole had been played once more, after which, with unassailable authority, he announced 'It is a very beautiful work and it had a very beautiful performance' and sat down, bringing the proceedings to a sudden unscheduled end! The superb National Chamber Choir of Ireland gave a special concert at St Finn Barre's Cathedral to mark that fruitful and -it must be said - costly innovation, which has been maintained under John Fitzpatrick's leadership, with his particular concern to promote educational outreach. The selected items were chosen by the choir's Brazilian conductor Celso Antunes from a total of 100 special commissions from composers of many nationalities. The acoustics are perfect and this was an enthralling musical experience, the music spanning 1962-1999. We heard commissioned works by Milhaud (1962), Walton (1974) and Shchedrin (1982), those by Walton and Ian Wilson (bluebrighteyes, 1999) particularly ear-catching, as was Fleischmann's Poet in the suburbs (1974 - not a commission, composed to celebrate 21 years of the festival). The effect of the NCC's concert as a whole was severely compromised by the lack of programme notes and words to follow; essential to make full sense of the word-driven musical settings, an omission remarked widely. To a lesser extent, this absence distances listeners to the competitive sequences of choirs too, and it seemed additionally counter-productive to have the lights generally dimmed (for dramatic 'atmosphere', I suppose?) making it hard even to follow our programmes! It is relevant to learn from Ruth Fleischmann's book that the modern commissioned works ruffled feathers in the City Hall concerts, where audiences preferred "an Italian choir singing Verdi or a Welsh male voice choir singing just about anything". Repeat performances of such 'difficult' music provoked hostility and the practise had to be abandoned. When audiences were given copies of texts and the house-lights were put on during performances, there was a greater acceptance of this 'NEW MUSIC', and under Celso Antunes the NCC has become far more experienced in negotiating the complexities of cutting-edge contemporary choral music than had been the case in the earlier decades. The impossibility of reconciling words, music and dramatic choreography was highlighted in the outstanding event (for us) of the whole festival, the late night performance by the versatile and uniquely accomplished Philomela of a sequence of choral songs by Turkka, Matveinen, Kähärä and others, many of them derived from the Kalevala. These young Finnish women had been trained by Marjukka Riihimäki to discover in themselves a palette of tones high and low, sweet and raucous, each girl emerging as a confident soloist from time to time. One could only begin to guess what they were singing about, but we were rivetted to their singing and expressive bodily language as they moved around the aisles and steps of the beutiful modern interior of Cork 's North Cathedral. Only after acquiring their new CD of the same programme could we discover that the texts carry enormous power and resonance in their exploration of women's lives, aspirations and griefs. The complete experience of this programme Mieli is only open to native speakers of their language, and in live performance. Next best must be the DVD which is crying out to be made (I understand that Philomela's creations have been televised in their native land) and must by example revolutionise the approach to their craft of choir directors and conductors who are fortunate enough to encounter this total musico-theatrical experience and think how some aspects might be adapted in their own presentations. A DVD including optional subtitled texts in a range of languages would combine the best of all worlds in this 'modern world music inspired by folk tradition and archaic folk poetry'. The National Choir of Ireland's concert of Cork commissions was recorded for broadcasting and hopefully may find its way into one of the Cork Festival's fine CDs (see review of the 2002 CD) and with the omission of texts, something of a hobby-horse of mine, remedied? The double CD of the 2003 Festival shows the pitfall of not doing so, notwithstanding expense considerations. Beyond bald titles of pieces sung, and initials and surname of composers, and of choirs and conductors featured, there is no information whatsoever. It can accordingly be only a souvenir for those who were there, and is not recommendable for general purchase, even though these may remain the only recordings of the two interesting commissioned works of the year. One of those is Ametsetan by Javier Busto in his fascinating, tongue-twisting native Basque language (e.g. 'txa-la' - q.v. Luis de Pablo's Zurezko Olerkia reviewed recently ) and the other Irish composer Gráinne Mulvey's demanding Stabat Mater for 17 solo voices. 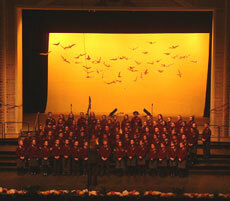 The Cork Choral Festival is to be commended for opening its doors to schools from all over Ireland . It was heartening to listen to so many children from far and wide trying their best. However many of the competing Irish children had yet to 'find their voices' and sing out with confidence; not all of the conductors were music teachers with training in voice production. It can only be hoped that music teaching, and the comparatively recent tradition of choral singing in Ireland, can continue to be supported to foster and do justice to a pool of potential talent, and help to encourage and preserve a musical culture in Ireland into the future, attended as it is by very evident personal and social benefits. To foster interest and enthusiasm in teenagers, the relatively recent Composer-in-the-Classroom scheme has latterly concentrated on encouraging children to become fledgling composers themselves. A presentation by two of John Spillane's pop-folk classes showed what can be done; a confident boy singer/composer demonstrated how boys and girls can be helped to surprise themselves and enter the world of practical music-making. It would be invidious for us to comment on the outcome of the contention for the coveted Fleischmann International Trophy. There was a great deal of inspiring musicmaking, but only the five adjudicators, multi-national and vastly experienced, had the benefit of scores in front of them. Their spokesman, Péter Erdei of Hungary, urged choir conductors to immerse themselves in national and period musical languages, and to utilise the full scope of stage space to enhance their musical performances, creating excitement for the audiences, but without distracting from the composers. Our own favourites, from Belgium, Czechoslovakia, Finland and Latvia, all won prizes and we were delighted that Marjukka Riihimäki carried off two of them, for Philomela and for her mixed choir Grex Musicus. Competition and entertainment were intertwined throughout the week in a packed programme throughout the city and beyond. Everyone will have carried away cherished memories; amongst mine were the youngest and best of the school choirs, staggering musicianship from Niamh Williams's primary schoolchildren of St Brigid's, Dublin. We saw Slovakian folk singing and dancing on European Accession Mayday, and on several occasions the stunning footwork of traditional Irish dancing; the smallest girl singer from Slovakia and the smaller of the Irish girl dancers in the Cowhie Ryan group radiated assurance and charm. Next year Cork will be the European City of Culture (the Festival having played no small part in the City's successful bid) and it would be an apt gesture for participating choirs to be encouraged to revive some of the ninety or so works commissioned since 1962 in their presentations and for some twenty or so of the best of them to be collected and issued as a commemorative CD in honour of Aloys Fleischmann's pioneering spirit. The final word, as last year, must be for the smooth organisation headed by John Fitzpatrick, and for the attentive care we privileged guests received from everyone. It must be a mark of the special standing of the festival among local people that it elicits the dedication of over 170 volunteers, some of them every year over decades. Their concerted efforts and know-how help to lift the Cork Choral Festival into a truly outstanding musical and social event. 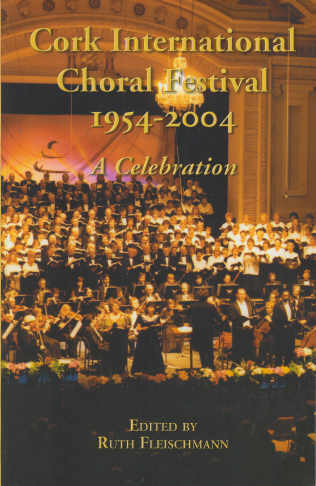 Ruth Fleischmann's monumental book, Cork International Choral Festival 1954-2004, A Celebration, is absolutely fascinating. Launched this week by the current Festival Director, John Fitzpatrick, at Guinness House, it is at once an important piece of social history, an intensely human document and an invaluable source of material for future musico/social historians. At just €20 it is incredible value. Dr. Ruth Fleischmann, eldest daughter of the legendary Aloys Fleischmann, did not write this book. That was done by 210 named contributors, people who have, over the last 50 years, performed an act of patriotism. In dozens of ways, these people have served Cork and Ireland, without thought of personal gain, contributing to the artistic and social fabric of the nation and, judging by their contributions, had great fun in the process. For special mention John Fitzpatrick singled out five of these, Helen Breen, May Downey, Moira Pyne, Dan Donovan and Tony Nolan when, on behalf of the Festival, he presented them with beautifully framed photographs of the 1996 Opening Concert. The same photograph adorns the cover of the book. Each of the five has been associated with the Festival since its inception, some in a very public fashion, others in behind-the-scenes activities, without which no organisation can function. The 14 Appendices alone will be of interest to any of the 800,000 (approx) people who have participated in the Festival in any capacity over the last 50 years. These Appendices, which make up just over one hundred of the 583 pages in the book list every choir that sang-and when, all the competitions, prizes and set pieces, the prizewinners, adjudicators, composers and works commissioned, the dance teams, opening and closing ceremonies and festival organisers and most of these are arranged both alphabetically and chronologically. The mere gathering of all this information was a worthwhile task. That it is so clearly laid out makes for easy reference by anybody who wants to know any of the factual information that may interest particular readers. However, it is the personal stories (the bulk of the book) that make this tome so valuable and fascinating. Here one discovers how something that grew out of a tiny seed planted by one visionary, Pilib O Laoghaire, was nurtured by another, even more unstoppable visionary, Aloys Fleischmann, into a movement that affected the lives of thousands and thousands of ordinary people, many of whom had, initially, little interest in choral music. These are the personal experiences of singers, conductors, families who hosted foreign choirs, people who sold ice creams, programmes and drinks, conductors, fáilteoirí (who had to find guest houses in all kinds of weather, often very late at night), adjudicators, people who set out the stage, journalists, dancers and people who rediscovered the Miracle of the Loaves and Fishes- in their own words. Some are funny, some poignant; all are interesting. 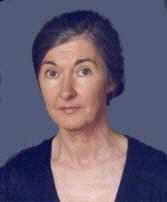 Without the invaluable help of her sisters, Anne and Maeve, Monica Gavin, Cumann Náisiúnta na gCór (which grew out of the Festival), the Contemporary Music Centre and the current and previous Directors, Ruth Fleischmann's task would not have been possible. Of the Festival's six Directors, Dermot Breen, Ted O'Brien, Sean Hendrick, Aloys Fleischmann, Geoffrey Spratt and John Fitzpatrick, the lengthy contributions by Spratt and Fitzpatrick are particularly interesting in explaining how things change and develop. Over it all, however, the name that is synonymous with the Festival is that of Aloys Fleischmann and this Celebratory book is a fitting testament to him - and to all who sailed with him. The National Chamber Choir (Conductor, Celso Antunes) gave a virtuoso display of choral singing at St Fin Barre's Cathedral on the second night of the current Cork International Choral Festival. - - The National Chamber choir comprises 17 highly trained singers whose music making is of international standard.and it needed to be. - - Almost nonchalantly, it seemed to me, the choir tackled the most technically difficult vocal music possible and carried off each piece with panache and a range of skills that it would be difficult to better. In one sense only, the concert was, for me, an almost total disaster; I had no texts, no notion of what the pieces were about. Spoken introductions by the conductor would have been a great help. Choral music, indeed all vocal music, is a compromise between words and music. In this recital, unfortunately, the items that gave me most pleasure were those with fewest words! - - Without Thomas Kinsella's sardonic text to hand, Fleischmann's brilliant, hideously difficult Poet In The Suburbs (1974) disappointed me. I could not hear the poem and, consequently, lost the point of Fleischmann's most harmonically adventurous and rhythmically outrageous composition. I have no doubts about the worth of this piece, considering it a minor masterpiece, nor about the brilliance of the performance.but it certainly does point up the nature of the words versus music compromises involved in composing choral music. - - Arts Officers in Cork have teamed up with Cork Choral Festival and, since 1998, composers in the Cork area have been visiting secondary schools all over the county, working alongside the music teachers in these schools and helping the students create their own music. The Dept. of Education and the Arts Council, recognising that something valuable was going on in Cork, have provided funding for the composers. - - This year, singer/songwriter John Spillane, whose songs have been recorded by, among others, Christy Moore and Mary Black, has been helping students from Mayfield Community School and Scoil Mhuire gan Smál create their own music. He believes in encouraging them to begin from where they are, writing words about what interests them and then finding a tune that fits. He then helps them to choose harmonies that feel right and finally discover what other accompanying voices/instruments will enhance the final recorded mix. Next year’s festival takes place from April 28th to May 2nd 2010 and we are keen to yet again attract overseas choirs to join us to take part in this celebration of choral music. Cork provides an opportunity not only to perform; but also to experience some of the world’s best choral music, soak up the atmosphere and enjoy the mingling, singing and fun of the festival club, and explore the vibrant city of Cork and its surrounds on Ireland’s beautiful south coast. Each year some of the finest amateur choirs are selected to compete for the prestigious Fleischmann International Trophy. The selected choirs also have an opportunity to perform in a range of additional festival activities throughout the week including fringe concerts, church and informal performances. Please click here to find more information as well as the application form for the Fleischmann International Trophy Competition of the 2010 Cork International Choral Festival. We would be grateful if you could further circulate this information to interested choirs. Should you require any hard-copies, or any additional information, please do not hesitate to contact us. Each year a number of very fine choirs are also selected to participate in the non-competitive strand of the festival. Participating non-competitively gives choirs the opportunity to present informal performances in various locations across the city, while having the possibility to meet with other choirs, see some of Ireland’s beautiful countryside, attend some of the festival events, sing, mingle, and soak up the festival atmosphere here in Cork. Non-competitive choirs are free to organize their own tourist activities while here, but are asked to please keep the festival office informed as their itinerary comes together to ensure that no time-tabling cross over occurs. To find more information and the application form for non-competitive participation, please click here.